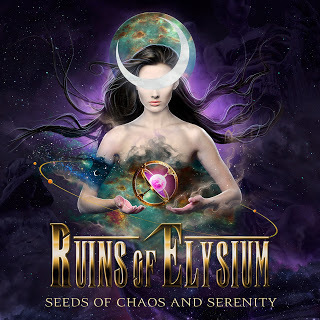 Continuing to uphold their past success, international symphonic metallers Ruins of Elysium have brought their epic sound and capabilities to offer even more bombast and grandeur into their material than their previous efforts. Taking a concept approach around the anime Sailor Moon for their epic title track, the groups’ sophomore full-length was self-released April 4, 2017. Similar to their previous effort, the band is once again in full-on bombastic and glory mode throughout this one offering a stellar look into their formula. Efforts like Kama Sutra, Serpentarius and The Birth of a Goddess showcase the grandiose tempos, featuring lightning-fast riffing and barreling drumming that is completely overshadowed by the bombastic keyboards that offer the over-the-top theatrics customary within the genre. It runs through these efforts with reckless abandon as the histrionics from the music match the spoken tales of glory and heroism that is captured expertly by these over-the-top rhythms giving this one the kind of driving attitude that works for the most part. That gets held up by the one detrimental, overriding flaw here in the overriding and truly bombastic five-part, near-forty-minute epic title track at the end, going on far longer than necessary to really prove its point and making for a truly exhaustive ending more than anything. The dedication to go for something like this, a massive mini-album in it’s own right as the five track suite makes for a fun enough representation of their work anyway beyond going through the motions of what’s on offer elsewhere on the album, yet the fact that it just goes on endlessly as the five movements clock in around regular-length tracks anyway and it just makes the album a drag to have to get through in order to experience it all. Though it’s fun enough, the daunting feel and approach are what somewhat lower this one.